Until 3 години with 10% anual interest rate. First installment 35% of the price. Payment plan with discount 3%. First installment 90% of the price. Dawn Park Royal Venera Palace is superb gated complex of apartments and townhouses, located among beautiful pine forest and set in the central part of Sunny Beach. The complex is placed 200 m from the beach and the sea. Nearby is to be found the main shopping street, where are placed some of the most elegant restaurants and bars in the resort. Within close distance is also the old town of Nessebar, famous for its historical monuments and rich cultural heritage. The complex combines unique architectural style with a harmonious interior design that focuses on the details. Moreover, Dawn Park Royal Venera Palace enjoys an impressive landscape with maximum preservation of the natural resources of pines and deciduous trees. The buyers can choose between studio, one or two bedroom apartments and penthouses with loft and a spacious bonus terrace with unique views. It also offers townhouses on two levels. On the first floor there is a spacious living room, kitchen and bathroom/wc, while on the second floor there are two bedrooms, bathroom/wc and terrace. Each townhouse has its own entrance and private garden, which is a bonus for the owners. There is also an opportunity for installation of a fireplace. Thanks to the amenities and extras offered, the complex Dawn Park Royal Venera Palace will be suitable for year-round holiday at the seaside. It is expected that the prices of apartments and townhouses here will increase in the progress of construction, so an earlier purchase of a property here will ensure a lower price. • Situated in the central part of Sunny Beach, 200 meters from the beach and the sea, as well as the main shopping street, some of the most elegant restaurants and bars in the resort. 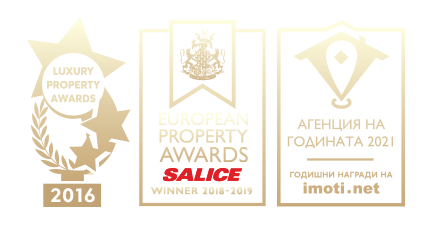 • Construction company with an impeccable reputation and numerous built and operating within complexes with apartments, including Down Park and Dawn Park Deluxe in Sunny Beach, Bella in the capital, Cornelia complex in the ski resort Bansko. The company is in the process of building complex Dawn Park Izida Palace in Sunny Beach and Olympia in Sozopol. Special prices for 5 apartments! Please, check the pricelist! The company investor offers professional property management through a registered management company. All owners must pay a fixed annual fee of 10 Euro / sq.m excluding VAT per apartment per year for the maintenance of the complex. All apartments in Dawn Park Royal Venera Palace are offered for sale unfurnished with fully furnishing package available at an additional fee. The bathrooms are fully equipped with water heater, shower, sink and toilet and are ready for usage. Dawn Park Royal Venera Palace combines unique architectural style with beautiful interior design that focuses on the details. Furthermore, the complex enjoys a spectacular landscape with maximum preservation of the natural resources, namely deciduous trees and pines. The buyers can choose between studio, one or two bedroom apartments and penthouses with loft and a spacious bonus terrace with unique views. It also offers two-level townhouses. On the first floor there is a spacious living room, kitchen and bathroom/wc, on the second floor there are two bedrooms, bathroom/wc and terrace. Each house has its own entrance and private garden, which is a bonus for owners. There is a possibility for a fireplace installation. The complex is highly suitable for year-round usage. Complex Dawn Park Royal Venera Palace is situated near a beautiful pine forest, but still in the central zone of Sunny Beach. It is located 200 meters from the beach and the sea, as well as the main shopping street, where are placed some of the most elegant restaurants and bars in the resort. Furthermore, the complex is a few minutes’ walk from supermarkets "Pearl" and "Mladost" that operate year round. Nearby is also the old town of Nessebar, famous for its historical monuments and rich cultural heritage. Because of this location, the complex provides the owners of apartments and townhouses and their guests with the opportunity for a peaceful holiday, away from the noisy bars in the resort center, yet within walking distance of them. In addition, the combination of sea air and pine scents, create an incredible atmosphere of peacefulness. Sunny Beach is the largest beach resort in the southern Bulgarian Black Sea coast, 35 km from Bourgas airport. The beach here is long and 8 km and 60 meters wide, the sand is fine and golden and the sea is calm and clean. The summer season here lasts from early May to late September. 1. All customers who have booked a property in the complex receive as a gift a one week free stay in the summer of 2013 in the complexes Dawn Park in Sunny Beach or Cornelia in Bansko according to their choice and until this option is offered. 2. All customers who have purchased a property in the complex will receive a free physical examination of the musculoskeletal system and also a free package of health services. 3. Every customer who has purchased a property in the complex, will receive special 10 % discount in the complexes owned by the group for the usage of all restaurants, shops, children's clubs, sports and entertainment events that are organized. Any apartment and townhouse in complex Dawn Park Royal Venera Palace can be reserved immediately with a non-refundable deposit of 2000 Euro, payable by credit card or by bank transfer. Upon paying the deposit the apartment will be reserved for the period up to the signing of the preliminary contract - within 28 days. • 30 % third installment during the third year, where 10 % might remain to be paid upon notary transfer, but not later than the beginning of 2015. Currently, Dawn Park Royal Venera Palace is under construction and has reached the third level of the building. The expected completion is scheduled for the end of August 2014.